A new article titled Paint Range Compatibility Chart has been added to the dakka articles system. This message thread is for the discussion of content in the article. Any updates to the article will be automatically added to this thread and (if you are logged in), you can get automatic email updates as and when the article changes by clicking 'Email me when this thread changes' below. If you are the author or have added a lot to the article then it is a good idea to do this to ensure that you maintain control over the content of the article. If you have anything to add to the article, then just jump in and edit it by going to the actual article page and clicking 'edit' (the link can be found just above the article). If there is no edit link then the article is locked for now, so just add your comments or content to this thread and if they are appropriate and the article owner checks this thread, they should get merged in. If there is something in the article that you wish to debate, then this is the place to do it. Just hit the reply button and get chatting. 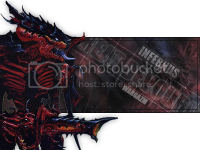 You need to be registered and logged in to post in the forums so if you are an anonymous article editor then now would be a great time to register and join in dakka's great forum discussion! Well I kind of moved near Toronto, actually. nice, I had been thinking of doing something similiar. I'm not sure if this is the best place to reply... but I haven't found much success anywhere else. I just ran out of a really really old Citadel colour called "Deadly Nightshade"... it's a really dark navy colour. 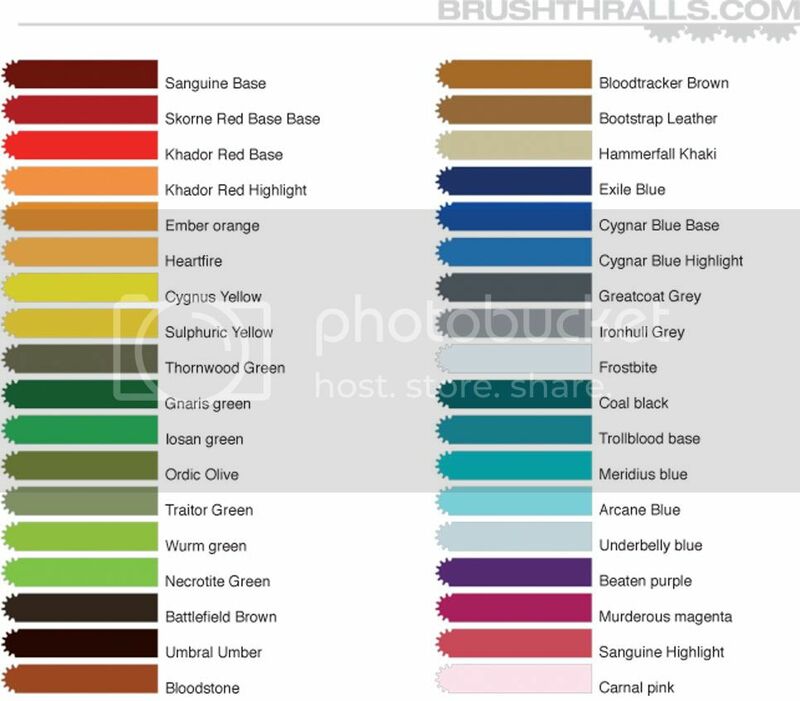 I haven't been able to find an equivalent with any current Citadel colour and I don't know if it matches up with any of the competitor paints. If you happen to come across it and add it to the list... please let me know. Wow! What a great idea. Well done guys! "Get on the Ready Line!" Orkeosaurus wrote: Yeah, but when he get's out he'll still be in Russia, so joke's on him. AzurePhoenix wrote: I'm not sure if this is the best place to reply... but I haven't found much success anywhere else. All of the really old citadel paints are carried by Coat D'arms so check them out and there should be a listing with conversion charts somewhere! 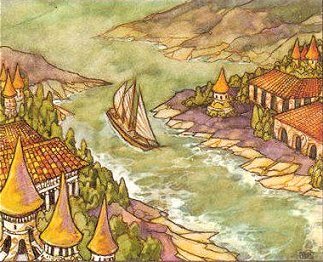 You can use the link to match the whole set of Citadel colours with another range such as Vallejo, Ral Partha or Foundry. However Nightshade Blue isn't on the list so they only do the Citadel paints that they insourced after they gave up on HMG (which became Coat D'Arms as you all know). The Coat D'Arms Fantasy range has an almost grey colour called Deadly Nightshade but then the paint chips aren't very accurate on this site as Angel Green looks grey as well. But this doesn't look like much of a dark blue colour so another colour from Cote D'Arms might do and perhaps the names of the colours are out to avoid copy infringement with the current range of GW paints. Yeah, I found that Coat D'arms still produces some of the old odd colours I picked up years and years ago. Deadly Nightshade is exactly the one I need and it's going to be nice to get a fresh paint pot that hasn't had it's life extended from water and thinners lol. I recently got a bunch of coat d'arms paints as well. I missed the metallic colours like enchanted blue... anyone else remember the metallic paint set that came out just before 2nd edition 40k? The PP section is a little thin on the ground. Finally got round to adding those two, thanks. Any chance that someone might be able to update the list? Most of the reference links are dead as well. This is fantastic it is a invaluable resource. Have a go at those, Legoburner. But we're not that bad... are we? This article has come to my rescue several times but never more so than now when I needed to buy a complete set of Vallejo Game Colors so that I can finally paint models here in Germany. I don't use GW paints (though I do use their washes and inks) unless there is no other choice so I quickly jotted down a list of compatible Vallejo colors. Now I have the paints I need. BTW, I edited the article by changing or adding to the names of four Vallejo Game Color paints. The labels on the bottles for Leather Brown (40), Black (51), Silver (52), and Gunmetal Metal (54) have different names than the compatibility chart (which reflects the previous catalog/stock order names for the paints). I'm not sure why the labels are now different than the catalog/stock order names but I changed the chart to add the label names since that is what a buyer will see in the store. Those who order online will see the catalog/stock order names. I was looking it over though and noticed something I thought odd; the article suggests that the Model Color equivalent of the Citadel paint "Bleached Bone" is "Pale Sand" (837). I don't happen to have a bottle of the Citadel paint but I have a bottle of both "Bonewhite" (GC equivalent) and "Pale Sand" and these two colours are certainly not the same. "Pale Sand" is a much lighter beige colour than the GC "Bonewhite" and so, this made me curious. After looking around on the 'net and, most importantly, taking a peek at the Vallejo website, I discovered that Vallejo maintains an equivalent value document in pdf format on their website. While it's not 100% complete, it offers equivalences for quite a large number of paints between the Citadel, Rackham, Tamiya, Model Color and Gamecolor paint ranges as well as a few others. So, after looking through this document, I found that the document has some discrepancies between it and the chart here one of which is the "Bleached Bone" example here; Citadel's Bleached Bone has an equivalent Model Color of "Buff" (976) according to Vallejo. Now, at least one of these colours doesn't seem to be right - Brazen Brass -> Copper (999) according to the pdf for example. This just doesn't seem right to me. The rest of the "corrections" seem like they might be right but I can't really confirm them as I don't have each version of these various paints on hand and my "local" game store is more than 100km out of my way sadly. So, just tossing this information out there to see if anyone is able to support or refute any of these "corrections". At some point, this article will need to be revisited to add in the new shades that have been produced as it is entirely likely that some of the gaps on the chart as it stands now will be filled by the new shades. I may be missing something here, but are the Vallejo Model Air colours different from the other Vallejo ranges? If so, could they be added to the chart? If not, ignore me completely! Thanks filbert, that is massively helpful of you! InyokaMadoda, Vallejo Air, Vallejo Model Colour and Vallejo Game Colour are three distinct ranges. Vallejo Air is a bit too different for direct comparison with the citadel line at this time, so is not listed as the matches are too far off in many cases to be useful. Looks good, but Kantor blue is listed in two different shades as Necron abyss and Regal blue. EDIT: Never mind, I just noticed that Kantor blue is the replacement for Necron abyss and regal blue. i AM TRYING TO PRINT THE PAINT COMPATIBILITY CHART BUT EVERY TIME I PRINT THE COLORS DO NOT SHOW IN THE PRINTED PAGE..CANSOMEONE HELP? The colours are background cells, so they will not print by default. Try copy and pasting the whole table into a spreadsheet and then try printing that. I'm glad Coat D'arms is included as supposedly they match the original GW paint formula with the white flip tops or something, but what about Foundry? They make a lot of paint and I use it along with Citadel, Vallejo, Reaper, etc. etc. Couple of the paints on the Dakka chart do not match what GW has suggested for example, Ultramarines Blue=Altdorf Guard Blue not Calgar Blue. Does any of the new paints match brazen brass pretty good? Brass Scorpion is too red and Runelord brass is too bright. If I had to pick one so far Runelord is the best. 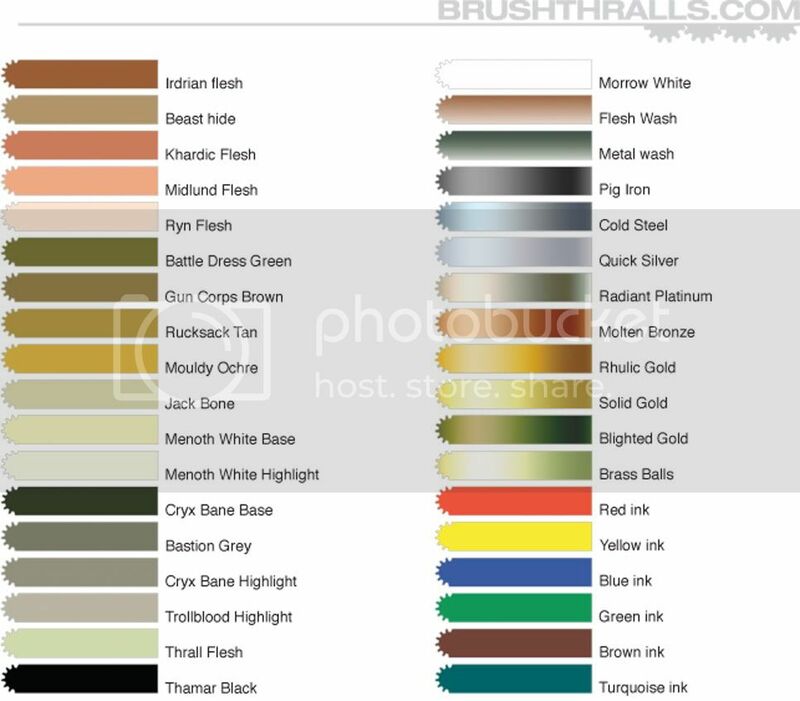 Is it worth updating this chart now comparing the new GW paints to, well, reality, as opposed to that paint chart. For example. And I've learned this through bitter experience. Wazdakka Red looks NOTHING like Red Gore. Wazdakka is significantly lighter. Ushbati does not match Bleached Bone. However, Screaming Skull does. Kantor Blue does not match Necron Abyss at all. Abyss is significantly darker.